Art of Bicycle Trips was born in 2010 when three friends decided to do a 100km ride to the outskirts of the city of Bangalore in India. Along the way, Pankaj Mangal, the soon-to-be Founder of Art of Bicycle Trips, realized that while cycles may be a utility device for some, for others it represents freedom, adventure, endurance and endless potential. The 100 km ride to the outskirts of Bangalore changed Pankaj’s perspective and beliefs on what cities have on offer for us and what cycling can bring to our lives. Views on work and life transformed, Pankaj quit his job at a cubicle soon after to guide visitors on bike tours and enable more people to enjoy simple pleasures of the outdoors, in the countryside, while cycling at a leisurely pace. Years after these humble beginnings, Art of Bicycle Trips is now a specialist in guided cycling holidays in India with offerings in Sri Lanka, Laos, Cambodia and Thailand for small groups. Pankaj continues to guide visitors to this day with some of his earliest clients returning year after year to cycle tour different regions of India, Sri Lanka and Southeast Asia with him. Art of Bicycle Trips pioneered cycling holidays in India back in 2010 when there were no other companies offering a full range of guided bike tours here. The intricately carved temples, the colonial churches; the bustling marketplaces of India’s cities and towns and the contrasting countryside villages have to be seen and at Art of Bicycle Trips we believe that all this only gets better when you are on a bike. If you are keen on cycling for one or two weeks to get to know more about the place, the people and the stories here in India, Sri Lanka or Southeast Asia, take a look through some of these Classic cycling holiday ideas. This part of the world is a treasure trove of historical, cultural and natural attractions that date back several millennia. So on cycling journeys with Art of Bicycle Trips, the effort is always well worth the reward. And we understand if you think a set cycling holiday itinerary is just not for you. So go on, customise your cycle tour. 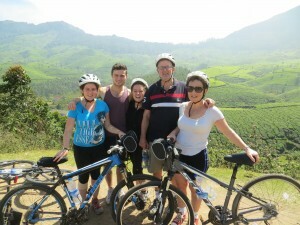 We will outfit you for cycling holiday of South & Southeast Asia on your own or with your Mom, Dad and Grandparents even. Add less cycling or more, see more UNESCO World Heritage sites or soak up more sunshine at the beach. Or add some outdoor activities – bike and hike to face some of the World’s highest mountains. Art of Bicycle Trips is here to make your cycling holiday happen. It’s your adventure. Do it your way, make it a private affair for just you and your friends and family, to enjoy, explore and discover together. Make it the trip of a lifetime! And don’t worry, we will arrange short multi-day bike trips that are three to six days long if you are pressed for time. With local Trip Leaders to guide you and handle bike repairs, you can pedal without worry on routes that have been crafted with care and refined over time. So come, take in the myriad sights, sounds and experiences that make this part of the world special. Art of Bicycle Trips offers quality bikes for bike tours along with a support vehicle so that you can get away quickly from high traffic roads and cycle at ease along the countryside – of India, Sri Lanka, Cambodia, Laos, Thailand in Southeast Asia. The support vehicle will carry your luggage and be available en route in case you get tired of cycling and want to sit back and take in the views. We will also handle all your hotel bookings for your next cycling vacation here so that you won’t be stressed about it. When you are not cycling with your bike tour guide, he or she will guide you on where to go, eat, shop and relax, so that you can experience the region like a local. Come join us to discover the hidden beauty of India, Sri Lanka & Southeast Asia at your own pace in small groups with friendly local guides as you pedal through it all. Most of our guests are from USA or UK. Folks from Europe, Australia and New Zealand come out with Art of Bicycle Trips frequently as well and if you are not from any of the above countries, then don’t worry, you are welcome too. We are a part of ATTA as it is the only platform that enables adventure tour operators from around the world to connect, learn and grow. So we look forward to hearing from adventure travel industry professionals and enthusiasts, especially from those in field of the cycle tourism.